After having just finished a late dinner before 9pm last May, we looked out our condo window and saw bears raiding the garbage bins across the street at our Port Moody Fire Department. 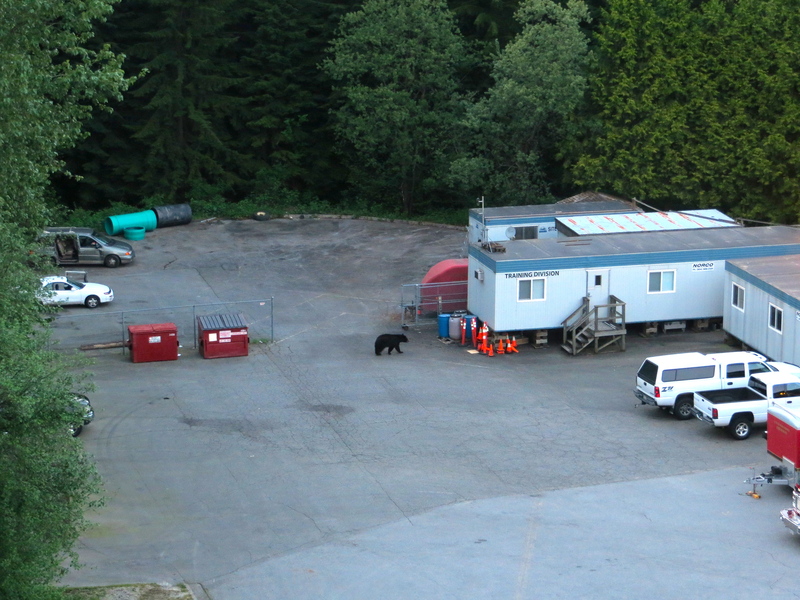 Bear sighting at Port Moody Fire Department on May 7, 2013. Last year, my picture was picked up from my blog about the sighting by a local newspaper, The Coquitlam Now, and their article circulated throughout the online news outlets, from The Vancouver Sun to the Calgary Herald and even to a news site that translated it to Chinese, which by the way, when we google-translated it, they completely added their own flare to the story, including saying that I was from Montreal?! Visited there once but, nope, never lived there. Fortunately, it appeared that all bins were locked up this year so no garbage for Mr. Bear as the firemen scared him away into the bushes where I hope no evening walker got startled. Yep, my after dinner walk just got cancelled tonight (Click to see my post on my bear fear).